I don't know how Rick Remender finds the time to write so many comics but I'm just glad he does. His latest title, 'Seven to Eternity,' with artists Jerome Opena and Matt Hollingsworth, is a meaty fast-paced fantasy that lays the groundwork for the plot in the debut issue while looking stunning in the process. 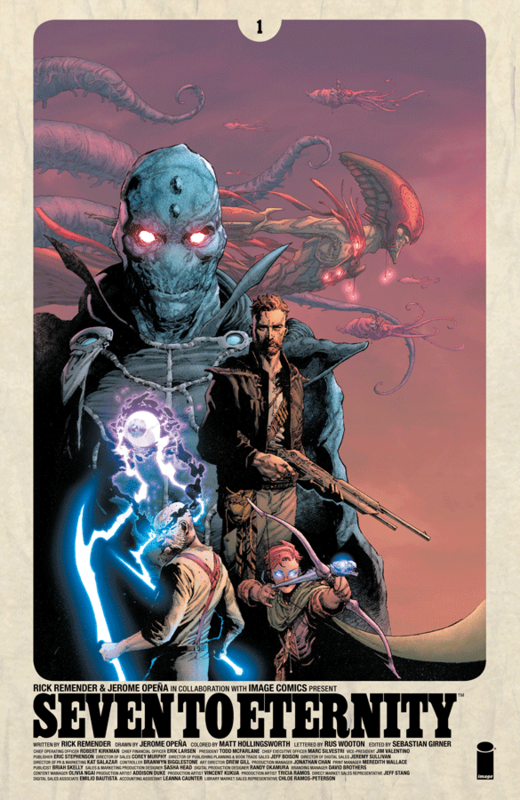 Remender mixes up genres - western, sci-fi, fantasy - to great effect. The House of Osidis falls into disgrace after the demonic ruler kills the patriarch and the family is exiled. Not content with living in peace far away from his homeland, a brave vengeful son, Adam, leaves his family behind to face the evil "Mud King" and hear what he has to offer. Despite the warnings of his father in the past, Adam is either on the path to righteousness and revenge or falling into a deadly trap? A lot happens in the first issue, from the initial great conflict, to Adam's decision to seek out the evil God, it feels slightly rushed with heavy exposition at times. The first issue could have used an additional ten pages to let the story breath.Nonetheless, 'Seven to Eternity' is a sweeping tale of revenge and magic that establishes itself as the next great fantasy title from Image Comics. Remender sets the table with all the players leading to a dramatic ending that will have readers demanding the next installment now. No fantasy comic worth its salt succeeds without a dynamic and visionary art team. 'Seven to Eternity' has that and more. Having worked with Remender on Uncanny X-Men and Fear Agent, Opena has a great eye for turning the script into a fully realized world as common as ours and as extraordinary as the imagination allows. He designs some creative creatures and landscapes that envelope the reader, immersive and wondrous, Opena doesn't hold back. Hollingsworth begins with some nice dark earth tones before giving way to more vibrant primary colors as the story leads to more otherworldly locations. It's a nice contrast that emphasizes the brilliance of the alien faction with the the literal down-to-earth hues of the humans. 'Seven to Eternity' #1 introduces us to another wild world from the mind of Rick Remender. It's brought to vivid life by Jerome Opena and Matt Hollingsworth. This story of sacrifice, honor, and revenge set in a fantastical and magical realm plays to the creators strengths, albeit a little rushed. Remender is chomping at the bit to tell this tale and it's worth every penny just to stare awestruck at each and every panel. This is highly recommended.